DJzone DJ Magazine :: ADJ Celebrates 30th Anniversary! Known across the world for its professional lighting, audio and stage solutions, ADJ has been creating versatile, exciting products since its inception thirty years ago. Respected across the industry and credited for various significant breakthroughs, the company has built up an international reputation for uncompromised quality, innovation and value for money. 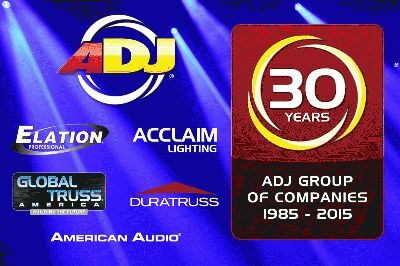 Established by current Chairman & Founder Chuck Davies back in 1985, ADJ started out supplying lighting solutions to mobile entertainers. Eventually, the addition of four off-shoot companies – Elation Professional, Acclaim Lighting, American Audio and Global Truss America/DuraTruss – enabled the group to expand and diversify by producing lighting, audio and staging products for nightclubs, mobile DJs and entertainers, concert tours, bands, TV and stage, houses of worship, and more. To mark this incredible thirty year milestone, 2015 will see ADJ hold a number of events; where the company, aside from celebrating, will give something back to its loyal customer-base. The first of these events will take place later this month, prior to the NAMM trade show taking place in Anaheim, CA. The day before the show – January 21 – ADJ will host a VIP open day at its Californian HQ, giving dealers and press members an exclusive first-look at the products set for launch at NAMM 2015 (which will run from January 22-25). As well as giving away limited edition swag and providing delicious food, ADJ will celebrate its thirtieth birthday by displaying a range of exciting new products in its state-of-the-art showroom. Dealers will also have the chance to order the latest gear prior to its launch at NAMM, allowing them to stay one step ahead of their competitors. Celebrations won’t stop there, either, as NAMM 2015 provides further opportunity for ADJ to show customers exactly what they have in store for the coming year. Amongst a number of new products launching at the show ADJ is going back to its roots with the release of three products in the Startec Series that are budget-conscious effects for beginner DJs, bands and house party hosts. 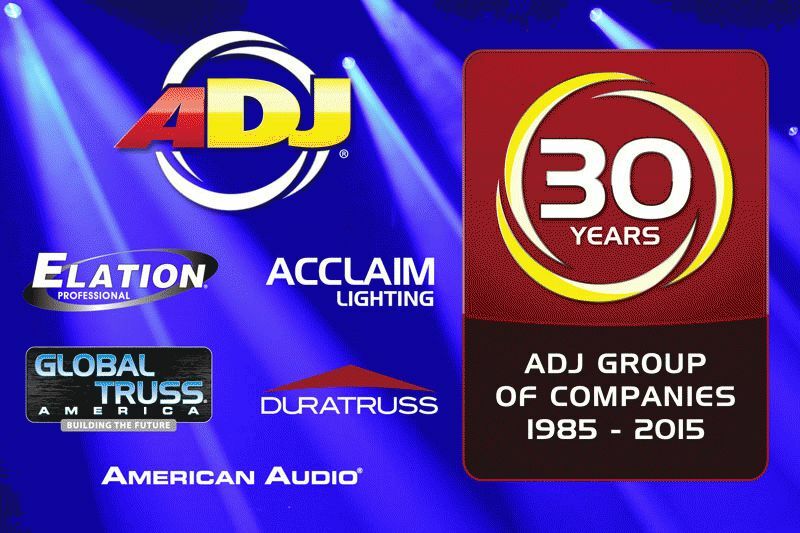 ADJ will continue to mark its thirty-year anniversary throughout 2015, with an array of events and product launches that continue to excite customers and push professional lighting forward.